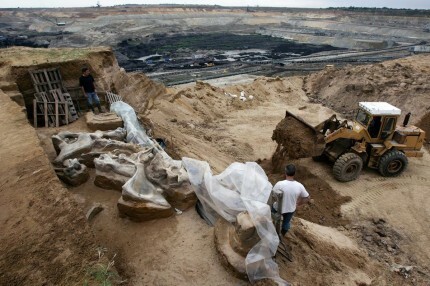 Workers digging at the Drmno coal strip mine in Kostolac, eastern Serbia on Monday, June 11th encountered the remains of a large woolly mammoth about 20 yards underground. They stopped work — the digging machines had already damaged the remains — and contacted archaeologists at the nearby Roman site of Viminacium asking them to come take over. A torrential downpour Monday afternoon delayed the archaeologists’ visit, but when they arrived on Tuesday morning, they found that the rain had revealed the remains of four other mammoths. It’s the first discovery of its kind in Serbia. 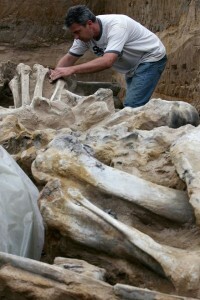 Individual mammoths have been found before, including one in 2009 at the same site. That one was a southern mammoth, a much older furless relative of the woollies. The southern mammoth, a female that researchers named Vika, is up to a million years old and is thought to have drowned on the banks of the Pannonian Sea, a shallow sea that dried up in the Pleistocene about 600,000-200,000 years ago. By the time the woolly mammoths roamed the area (they died out around 10,000 years ago), it was the delta of the prehistoric Great Morava River. The five mammoths discovered this month were located more than 30 feet above Vika’s find spot. They may have all died at once in the same place, killed by a natural catastrophe like a flash flood, they may have died at different times in the same place, or they may have been carried to the spot by torrential waters. It will be at least six months before all the bones are excavated, and archaeologists believe there may be more to be discovered. Once they’re out of the ground, it will be many years before all the research is published that will tell us exactly how old they are and how they died. There was some excited speculation when the find was first announced that this might be the first mammoth graveyard ever discovered, a place to which mammoths traveled long distances just to die there as modern elephants do, but at this point there is no evidence whatsoever for this idea. It’s an important and rare find even without the mammoth graveyard glamour. Studying the remains of the mammoths and the field could provide new information about the flora and fauna of the Balkan ice age. 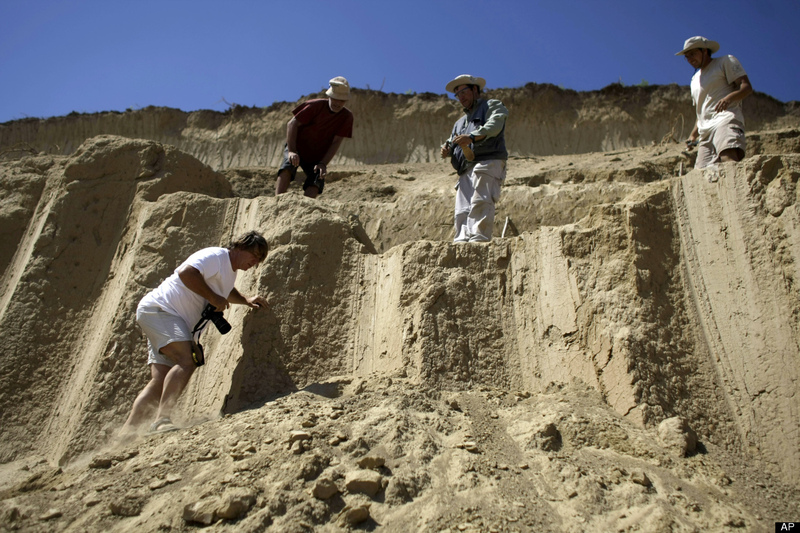 The owners of the strip mine, Serbia’s national power company EPS, have stopped all operations at the Drmno mine to allow archaeologists to work unimpeded.